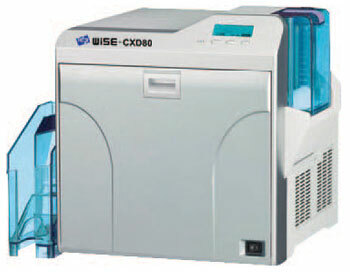 The IDP Wise CXD80 Retransfer ID card printer is a reliable solution to print highly-secure cards and badges on the spot. Retransfer technology guarantees over-the-edge printing for superior print quality and maximum card security. 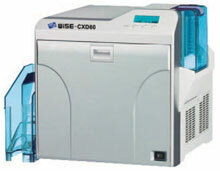 With up to 40 seconds per card (YMCK), the IDP Wise CXD80 Retransfer printer will issue all your cards fast. Build the printer that you need with a single or double-sided printing module. Add a laminator to create secure cards and reduce the risk of counterfeiting and tampering. Service Contracts, 4th Year advanced exchange warranty, all SMART Printers, includes Smart-30, Smart-50, and Smart-70 Printers. Service Contracts, 5th Year advanced exchange warranty, all SMART Printers, includes Smart-30, Smart-50, and Smart-70 Printers. ID Card Ribbons, DNP Hologram laminate film, 1mil (25mic) thick, to be used with lamination module (part: 670113 or 670114) to provide an extra layer of security and durability. 1 laminate roll covers 1,000 cards. ID Card Ribbons, Clear patch type laminate film, 1mil (25mic) thick with smart card cut (B Type), to be used with lamination module (part: 670113 or 670114) to provide an extra layer of security and durability. 1 laminate roll covers 600 cards. ID Card Ribbons, Clear patch type laminate film, 1mil (25mic) thick with smart card cut (A Type), to be used with lamination module (part: 670113 or 670114) to provide an extra layer of security and durability. 1 laminate roll covers 600 cards. ID Card Ribbons, Clear patch type laminate film, 1mil (25mic) thick, to be used with lamination module (part: 670113 or 670114) to provide an extra layer of security and durability. 1 laminate roll covers 600 cards. Note: Need help? Just ask. Call (800) 321-4405 or Chat now.